As the far western part of Canada began to be settled by immigrant farmers, the task of opening up the land to arable condition was a huge challenge. The smallest property sold for this purpose consisted of a quarter section, about one half mile square, approximately 160 acres. The hard ground, matted with roots from centuries old grass covering it, was particularly difficult to plow. The opening of the western prairies around the turn of the century coincided with the growth of the steam engine for use in pulling plows. 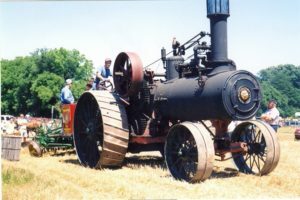 In the 1900 to 1910 period, the steam traction engine manufacturers started building huge engines with maximum weight for traction. 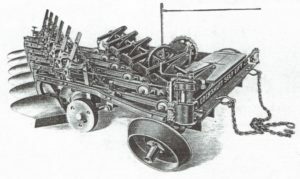 Plow manufacturers like Cockshutt Plow Co. of Brantford developed large plows to take advantage of this extra power to more quickly open up the land for agriculture. The tremendous pulling load imposed by these huge plows, turning as many as twelve furrows, soon caused structural failures in some engines and most of the manufacturers undertook specialised reinforcing for this purpose. The Robert Bell Company of Seaforth, Ontario encountered boiler leaks in its engines from these loads and subsequently added an independent steel frame running from the front axle to the rear, and containing the countershaft, gear shaft and rear axle mountings to relieve the boiler of all gear strain. No one bothered about the extra weight which was considered a bonus for added traction. Other major engine manufacturers such as Sawyer Massey, Waterloo, George White and Abell, heavily reinforced the rear drive wheel mounting, increased the size of the drive gears, and increased the size of the drive wheel spokes. Some moved to twin cylinder compound engines, with rated horse power from 32 to 40 hp., to handle the plowing, when the 20 hp. size engine had to date been more than adequate for all other purposes. Extra large water tanks were usually fitted to ensure that long days could be worked. 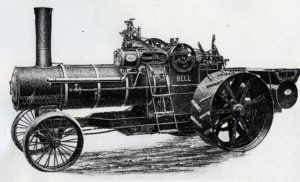 Abell built one of the largest engines, weighing some 24 tons, and equipped it with worm gear operated front steering wheels mounted close together to make it easier to steer, and giving it a “row crop” look (although that term was still in the future). Despite all of this development work, the steam plowing engine enjoyed only a short career as the gasoline engine tractor was introduced in the first decade of the 1900’s. Its relative ease of operation and ability to start up quickly, as compared to a steam engine that took up to several hours after lighting the fire to get the steam up to pressure, soon proved a desireable factor for the operators. 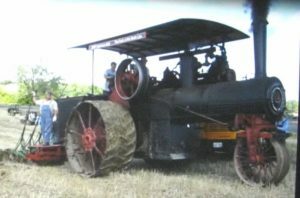 By around 1920, the big steam plowing engine had had its day, especially as the once turned over prairie no longer required such large power units for subsequent plowings, and as the gasoline tractor became more efficient and less costly, it quickly rendered the steam engine obsolete.